New book, 256 pages. Starting in 1955, and for the following 20 years, MiG-15 and MiG-17 formed the backbone of several Arab air forces. They played a prominent role in four major wars and dozens of minor incidents. 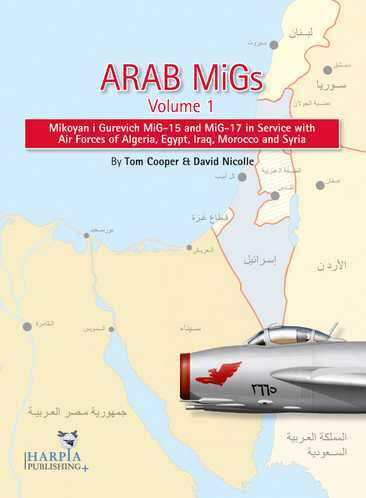 Covering the first decade of this period, this study - Arab MiGs, Volume 1, the first in a series of publications - provides a unique and previously unavailable insight into the service history of both types with five Arab air forces. Even more so, it tells the story of the people that flew MiG-15s and MiG-17s in Algeria, Egypt, Iraq and Syria. Several of whom became dominant political figures in the recent history of these countries. The reason why Arab countries began purchasing MiGs and thus became embroiled in the Cold War is approached and discussed from an entirely new and original - Arab - point of view. Details about combat operations during three major wars between Arabs and Israel, as well as the war in Yemen of the 1960s, are reconstructed on basis of primary evidence, in the form of original documents and participants' recollections. Aircraft colours, unit insignia, serial- and construction numbers are described in unprecedented detail. Over 200 photos, colour artworks, maps and tables illustrate the story of aircraft and their crews.